When an inmate arrived at Alcatraz he was issued a blue woolen coat, blue woolen trousers, and two blue woolen shirts. This was the holiday and Sunday uniform. He also received two pair of brown shoes, work and dress. He was issued underwear, six pairs of socks, a blue cap, a blue handkerchief, and two coveralls. The blue-gray checkered coveralls became his daily uniform. He was then taken to his tiled cell which measured 5' x 9' 7' and contained a steel bed, mattress, foldout table, two shelves, a toilet and a sin. Shaving was supervised, three times week and the prison's 'Rule of Silence' meant that meals were eaten in silence. The once-a-week showers were taken under strict supervision in an open shower room with no walls. Visitors were permitted once a month but only seen from behind glass. Gifts from the outside were forbidden but inmates with good behavior were allowed to write one letter a week to relatives. The ultimate privilege was time in the recreation yard. Inmates worked an eight-hour day in the prison's industrial shops, five days a week. Movies were played twice a month and selected radio shows were piped into earphones in the cells.Free time was from 6 to 9:30 pm. 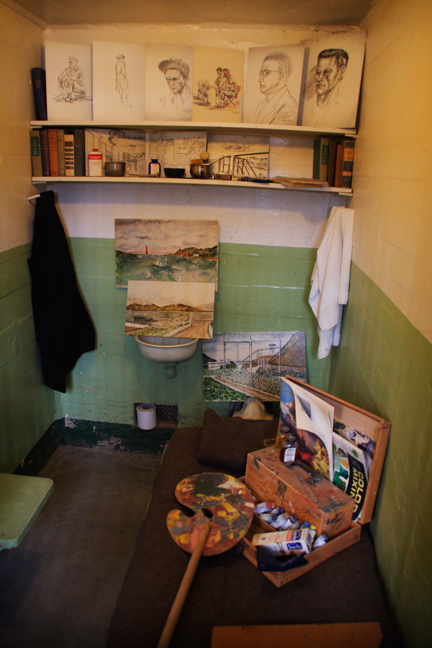 The inmates were allowed to read, write, or pursue a hobby such as painting during those hours. Inmates who did not follow the rules had chilled air blasted into their cells from high vents. Corporal punishment was also administered to inmates who were shackled to the wall. The ultimate punishment was extended banishment to the isolation of 'The Hole', a freezing cell where the inmate was stripped and left in total darkness. Prisoners who went mad were moved to the psychiatric ward were the floors were also tiled and the toilets were simply holes in the floor. Drugs were not used as treatment in Alcatraz so unruly behavior there was treated with frigid air. Due to the length of most sentences Alcatraz eventually found it had a large population of seniors as inmates and no plan to care for them. The aging population was one of the factors that led to the closing of the prison.